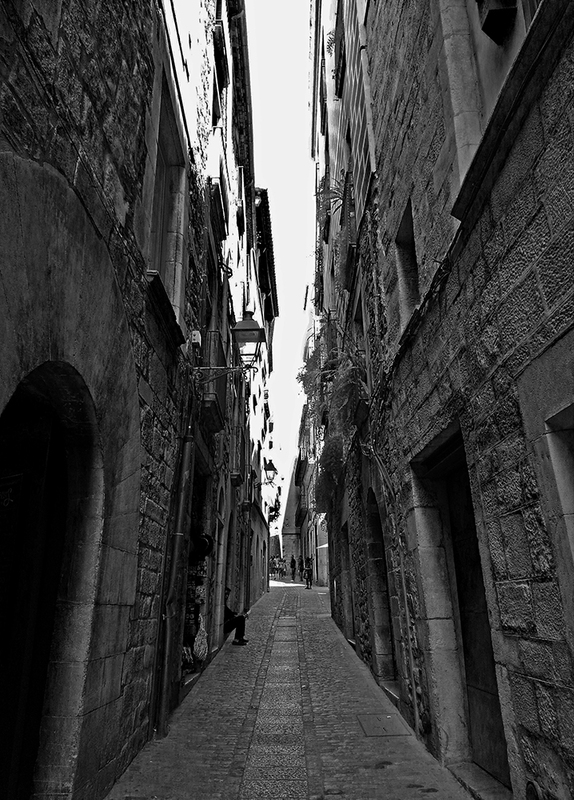 Rocambolesc , Girona …. 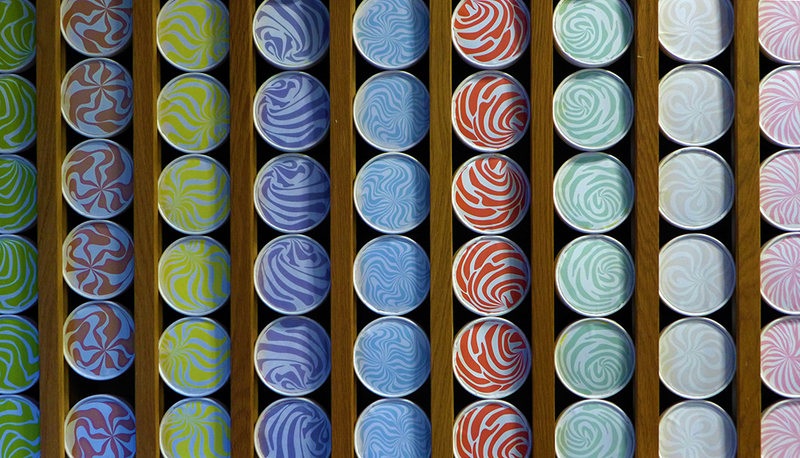 Could this be the Worlds best ice cream shop ? 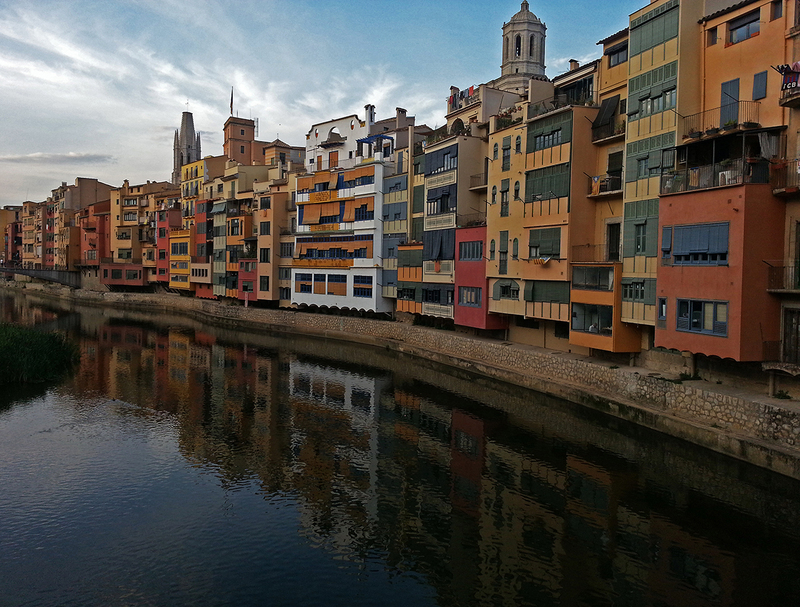 Visitors to Girona will notice the sheer amount of Gelateria and ice cream parlours dotted all around the city. They`re beautiful little set ups decked out in traditional yesteryear styling and dotted every few paces in and around the old town and the citys main shopping streets of the Santa Clara area. I also observed that almost all of them were almost empty apart from one…. “Rocambolesc“.This crazy little outlet had a queue right through the shop and out on to the street…and why ? Simply because it was owned by the Roca family and having the shiny new title of “Worlds number one restaurant” in their bag, could they also hold claim to ” Spains best ice cream shop” at the same time ?. Visions of the Pied piper of Hamelin or the Child catcher on Chitty Chitty bang bang teased children magically across the street towards the shop entrance. Once inside they became the latest victims of Jordi Rocas spell. 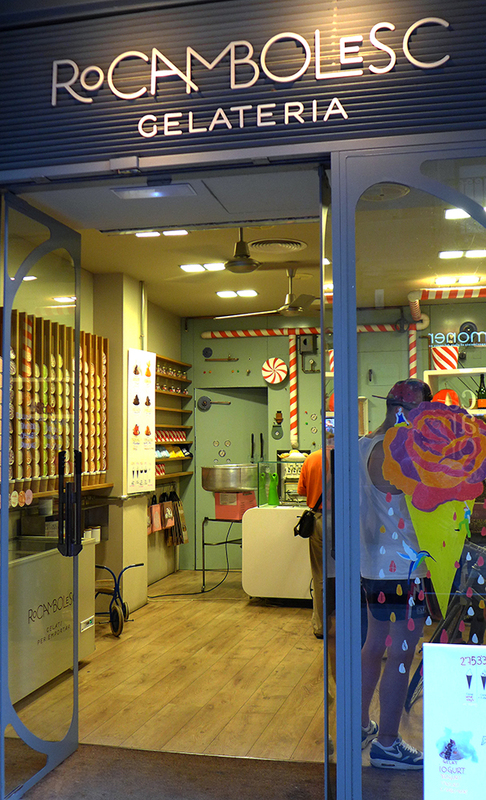 As soon as we had arrived in Girona and unpacked our bags it was a case of “fancy some ice cream” ? and we headed straight out into town. 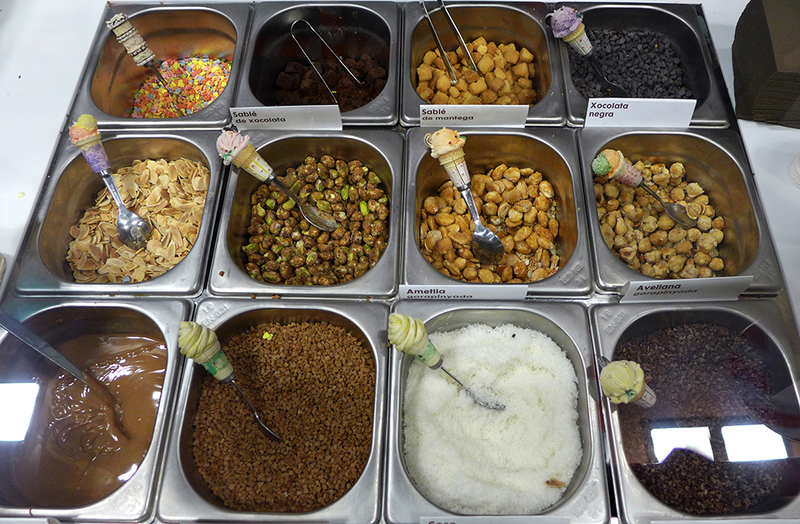 I had done a little research prior to the trip and being an ice cream freak i knew exactly where i was heading to…. 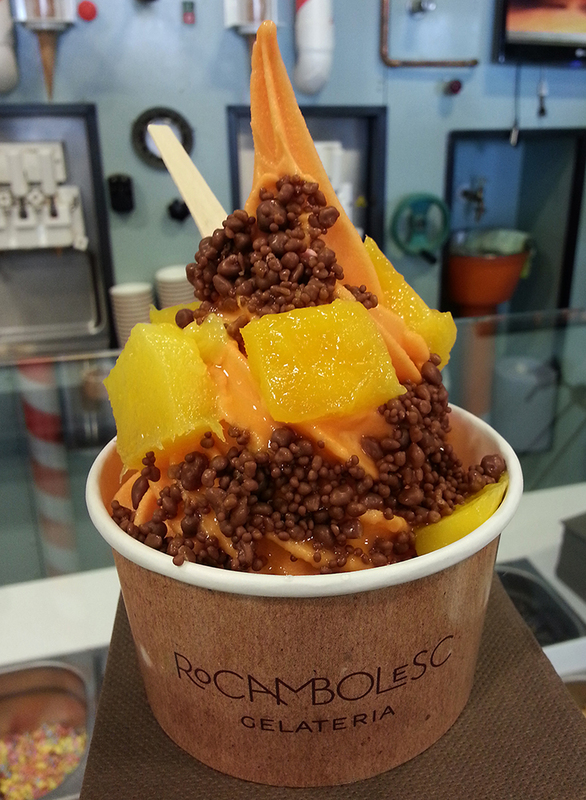 The Willy Wonka styled ice cream shop better known as `Rocambolesc` by the Roca Brothers. 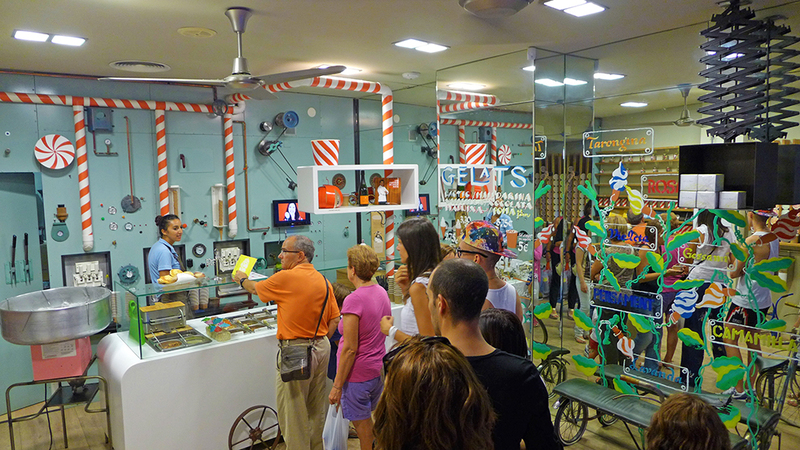 Jordi Roca , `El Celler de can Rocas` Pastry chef created this shop and his wild imaginative sweet fantasies were in top gear when doing so. There isn`t a large choice of flavours here so don`t go expecting a hair pulling exercise as there`s only 6 to choose from….and of course we decided to have all 6 ( over a few days of course ).They only do a small amount of flavours but they do them well….extremely well. 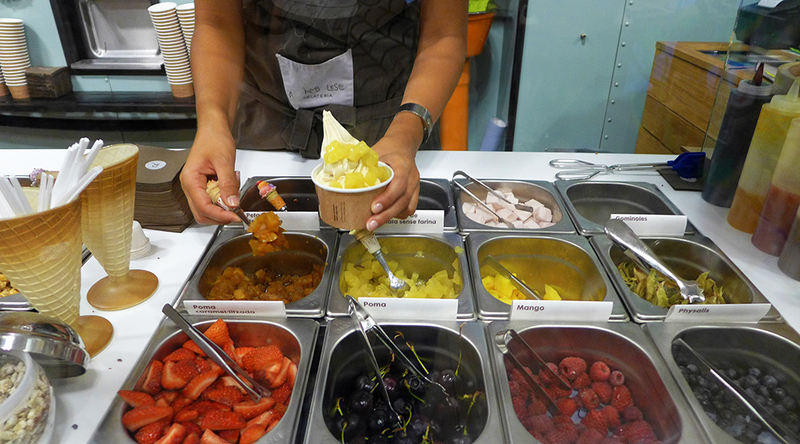 4 ice creams and 2 Sorbets and that`s your lot. The twist in the tale comes from the 34 toppings and this is where you will definitely pull your hair out trying to decide which ones to go for. 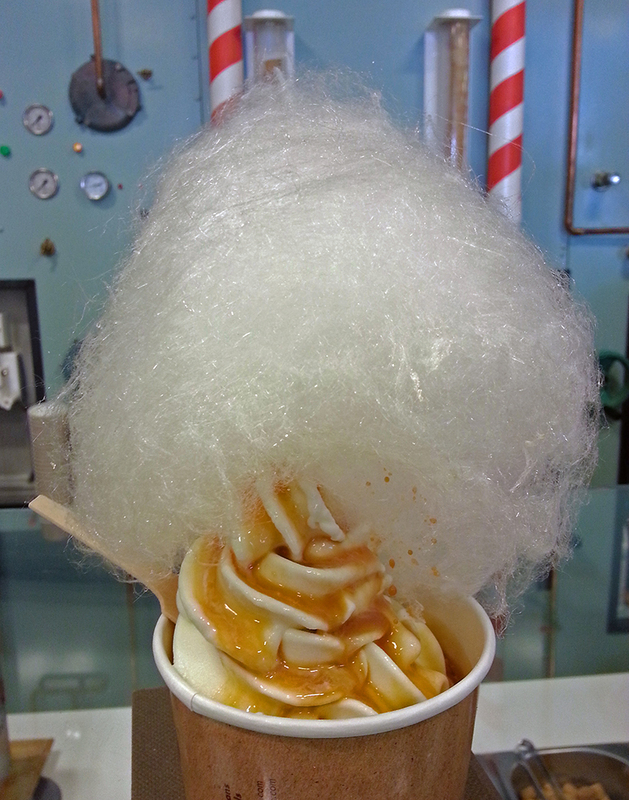 I simply let the young lady behind the counter make the choice for me and off she went with her `soft serve` style Ripollesa Sheeps milk Yoghurt ice cream topped off with freshly spun Candy floss.I have to admit that it definitely brought the child out in me as it was so much fun to eat. 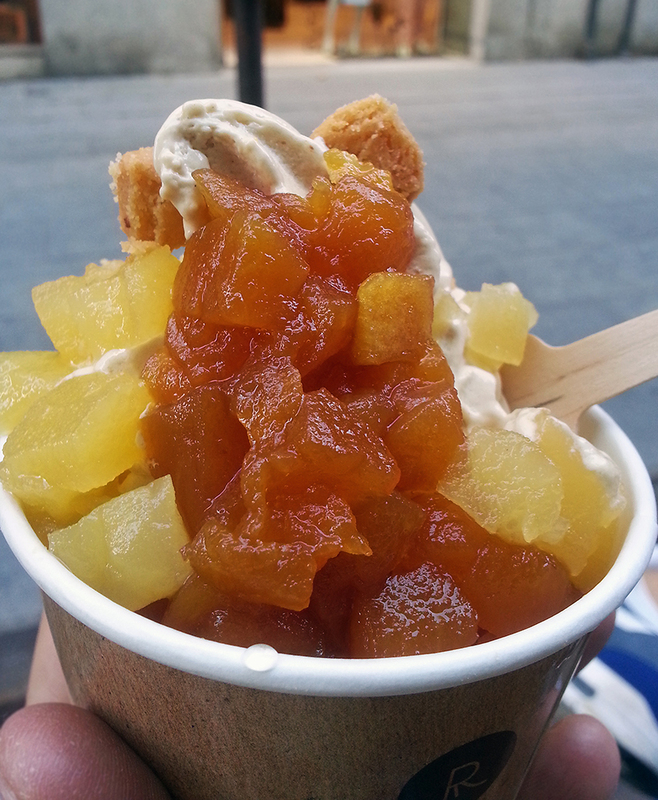 This is the Baked Apple ice cream with Caramelized and baked Apple….and little squares of Apple pie shortbread. Apparently all of the ice cream flavour bases are created and manufactured up the road in the family restaurant Can Roca. They are then sent down to the shop by bicycle. Here`s a combo of Chocolate and Vanilla seed ice cream with Chocolate Brownie and Chocolate covered popping candy. 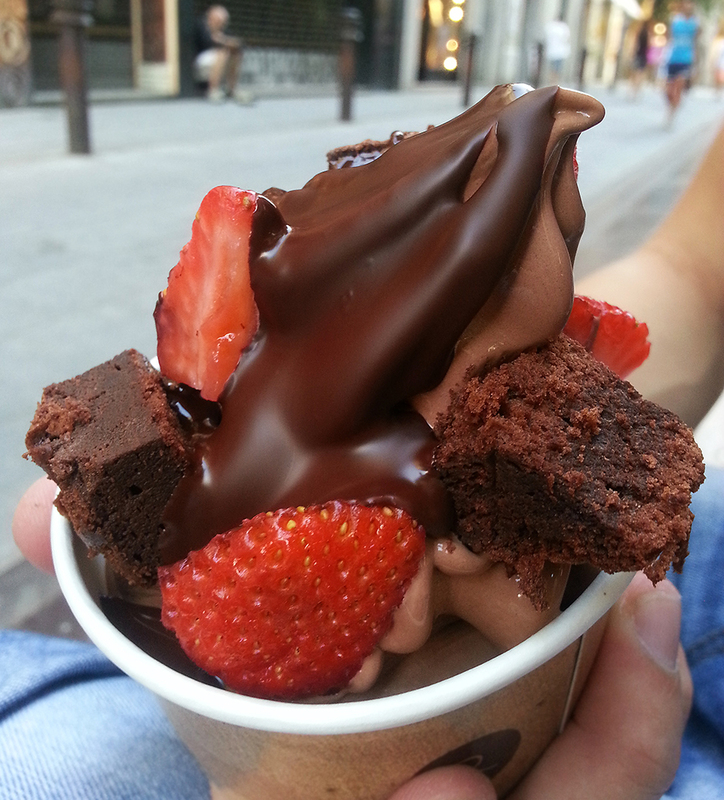 Chocolate ice cream with Strawberries, Chocolate sauce and Chocolate Brownie. 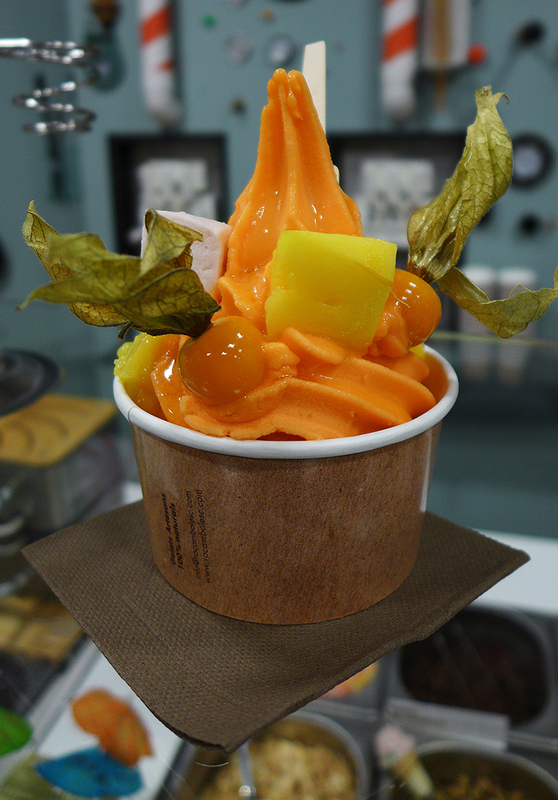 Carrot Sorbet with Mango , Cape Gooseberries and Marshmallow. 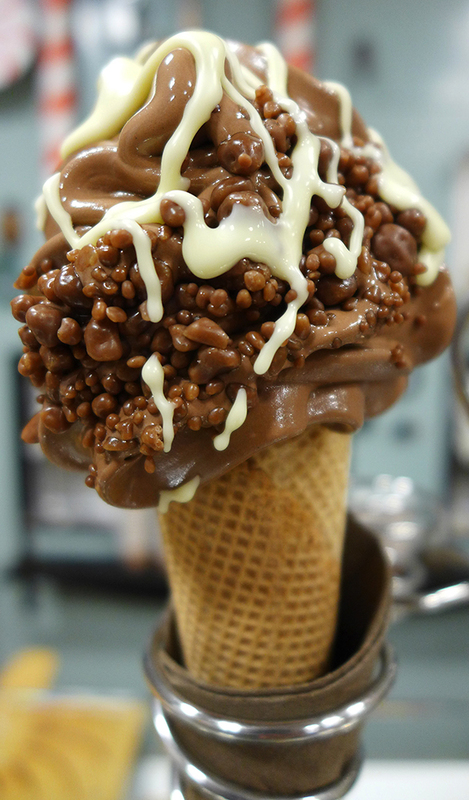 Chocolate Cone with Popping candy and White Chocolate sauce. Rocambolesc acts as a little teaser as to what`s happening up the road at the Mothership restaurant `Can Roca`. 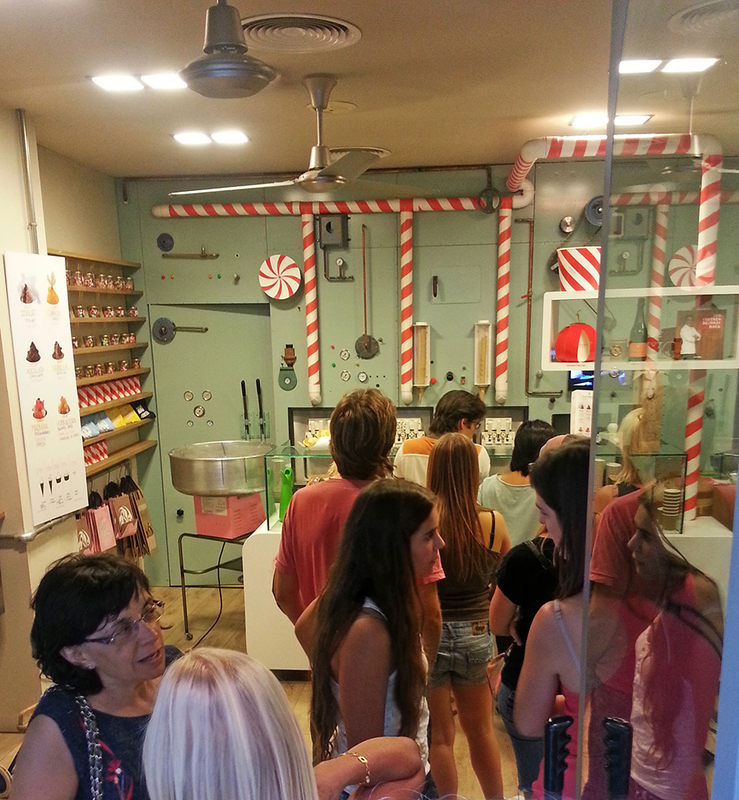 The ice cream shop is a far cheaper alternative way to sample the sweet delights of Jordi Roca and at the same time you`ll be able to treat yourself to a designer `Roca fragrance` or a Roca cookbook to recreate some of Jordis classics when you get back home. Carrot Sorbet with Mango, popping candy and Orange sauce. 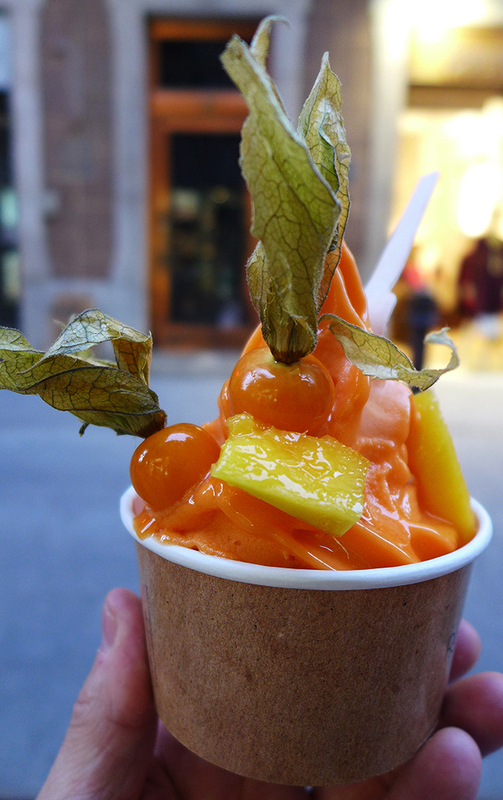 Another Carrot sorbet with Cape Gooseberries and Mango. 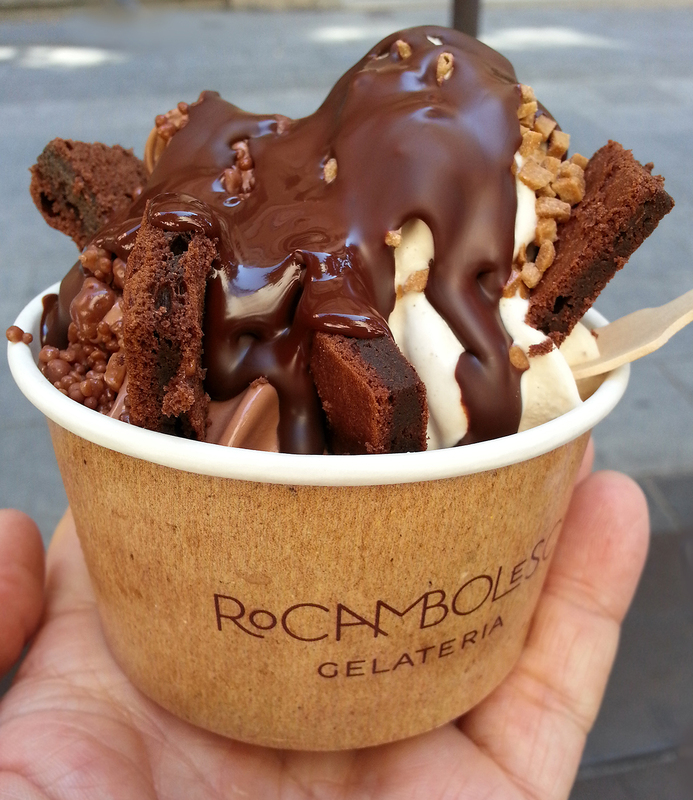 So without doubt Rocambolesc simply has to be on the list for the foodie traveller heading to Girona. I would guess that a very large percentage of food lovers visiting the city are here for the one reason only so now you have two. Oh and when you see my post on Massana you`ll make that Three. Next Post The Best Restaurant in the World ? Really brilliant photos and descriptions! Top class!